Θα σας αρέσει πολύ η Κυκλαδίτικη αρχιτεκτονική στη Φολέγανδρο, καθώς και η καταπληκτική θέα από όλα τα μέρη στη Φολέγανδρο. Η Φολέγανδρος μας θυμίζει λίγο το νησί της Σαντορίνης, καθώς η πόλη του νησιου (η Χώρα) είναι χτισμένη σε ύψωμα, κοιτάζονατς κάτω τη θάλασσα. Διαβάστε περισσότερα . . . The Folegandros villa is an oasis of peace and relaxation situated in the peaceful village of Ano Meria. The villa is made of White washed walls and stones and is fully integrated with the surroundings. The ceilings are made of wood and the floors of polished cement .The furniture are modern and the villa successfully blends the traditional architecture with the contemporary elements. We offer studios , all with private bathroom, kitchen with utensils, refrigerator, air-condition, and T.V. Some of the studios have balconies or verandas. From here, young and old enjoy the famous quality of Cycladic light and the romance of magnificent island sunsets. We are waiting to offer you our hospitality in a beautiful surrounding. The hotel offers 17 superior rooms of different types, 3 Junior Suites and 8 standard double rooms. In all areas traditional art has done wonders. 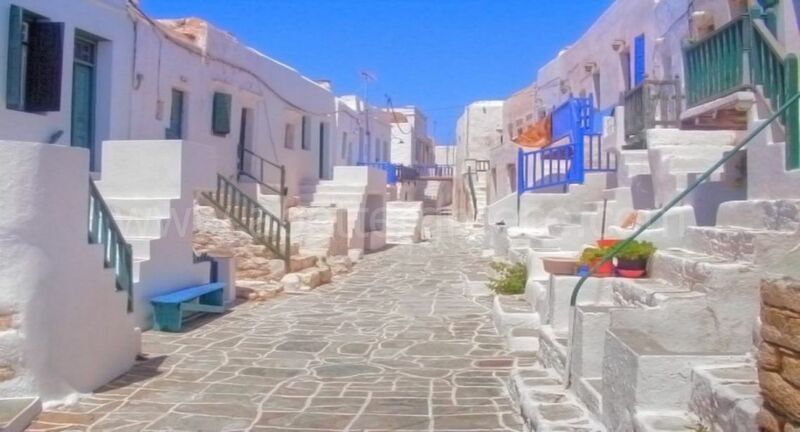 Located in the seaside settlement "Karavostasis", which is the port of Folegandros. It is 2.8 km away from Chora (capital) and approximately 20 meters away from the sandy beach of Vardia.There are 3 very nice levels, which consist of traditional island style complex of 17 studios and 4 apartments, situated on the top of a small peninsula and commanding a fine view of the village and the sea.